Jason Ryan’s “Fundamental Series” is a “gotta have” animation resource and this is why it is number 3 on my list. Jason Ryan the founder of iAnimate.net has a series of online webinars and videos. All of the lectures are great but if I had to choose a specific series I would choose his “Fundamental Series”. This series is great for new animators who are struggling with concepts like overlap, timing, and spacing. Jason Ryan does a great job showing on screen the fundamentals of animation, and explains them in plain English very well. The fundamental series is worth every penny. For more skilled animators I would look at the “webinar series 2”, this series goes over “cartoony” animation and will help you beef up your demo reel. Get Jason Ryan’s Fundamental Animation Series. 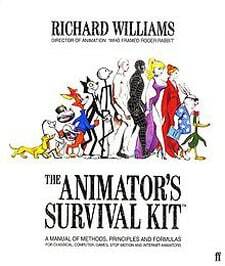 The Animator’s Survival Guide I believe is THE animation book to have, this is why I placed it higher than “The Illusion of Life” on my 10 best animation books list and the animation resources list. The Animator’s Survival Guide is referred to as the “new testament” in the animation world. Richard William, the director of Who Framed Roger Rabbit, and legendary animator wrote this book. Unlike other animation books Richard William shows you wonderful examples of the 12 principles of animation, and body mechanics. He does it in a way that is easy to understand and grasp. The best part is that he uses images, not text, novel concept…. If you would like to know more about The Animator’s Survival Guide, I would suggest reading my 10 Best Animation Books list. Animation Schools, or Online Animation Schools, makes it to the number 1 spot on my best animation resources list. Go to school and learn! Research and find the school for you there are some great “traditional schools” out there like Cal Arts, or San Jose State. Or you can look at online animation courses like Animation Mentor and iAnimate.net! The most important thing is finding a community that inspires and pushes you to be better. I went to UC Davis for my undergraduate. There I got a very general degree, but was able to go to Disney’s Inspire days. While at Disney’s Inspire days a recruiter told me to check out Animation Mentor. To be fair, I went to animation mentor. I graduated with their Character Animation and Creatures Certificate. I know that there are other online schools out there for animation. I personaly believe that ianimate.net is a great online “school” as well. Jason Ryan, the founder of iAnimate.net is very inspirational. Here is my brutal opinion about online “”Animation Schools” in general. I personally believe that people should also get a bachelor’s degree from a brick and mortar school. I graduated from UC Davis, and I am very thankful. The animation industry in the United States is struggling. Lots of jobs are leaving the United States and going overseas or up to Canada. Even if you are in those other countries I feel that unless you are going ALL in or have a natural talent, you should go to a traditional skill before, or while, doing an online animation program. College provides you with growing experiences that an online program cannot. Life is much more than sitting in front of a computer. It is about making connections. If you are lucky enough to go to college, you will meet new people, be placed out of your comfort zone, and make memories that you can draw upon for inspiration. Plus, kids in college change majors nearly four times. I don’t want to be a downer but you might have other dreams that you don’t know about. I am not saying that college is for everyone, some cannot afford it or have any desire. I get that it isn’t for everyone. College also doesn’t mean you are more talented or smarter than others, but it does provide a safety net in case the whole animation thing doesn’t work out. It isn’t fair that certain people on average earn more money because they have a silly paper that says “bachelors of bla bla bla” on it but that is the world we live in. I am not saying to give up and if you want to go all in do it! I am just saying be smart about it. The professional animators are amazing and provide great feedback. The online lectures are great, and I am happy that they finally made it so you can watch all the lectures. You use to only get to watch them while enrolled in that session. Now you can look at old lectures. I hate the idea of “grades”. I understand that they are trying to push students to be better, but it just adds an un-needed stress. I wish it was more “one on one”, when I went through it you would basically get one fifteen minute critique a week. I wish you would get more. What I have heard from ianimate.net students it has more of a one on one feel, and that you have access to tons of lectures and feedback. I know that lots of students who graduate from Animation Mentor look at iAnimate.net after they complete animation mentor for more “schooling”. That’s it my list of “Best Animation Resources for Learning Animation”. I would also suggest watching lots of animation and asking lots of question. If you don’t agree with my list let me know in the comments below!